Nine years after a prominent Los Gatos business man was gunned down in front of his house, the main suspect convicted in the killing is speaking out and making big accusations about the people who prosecuted him. Police said at the time that Paul Garcia hired hitmen to kill businessman Mark Achilli because of a love triangle. 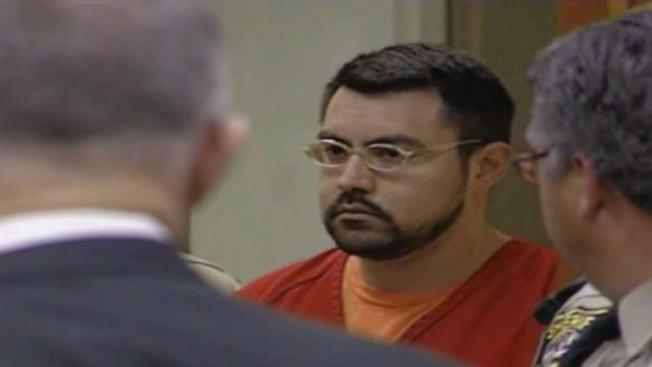 On Thursday, ahead of a Friday hearing in the case, Garcia from prison told NBC Bay Area he is an innocent man. Garcia on Friday will try to convince the trial judge to take another look at the case, questioning the integrity of the investigation and the prosecution. Achilli was gunned down in the early morning of March 14, 2008. Four men were convicted in the killing, including Garcia, a Bellarmine High School graduate. Garcia was convicted of hiring the hitmen to kill Achilli. Prosecutors said Garcia and the victim were involved in a love triangle with Tessa Donnelly. "Well, I'm factually innocent," Garcia said during a telephone interview from prison. "I've maintained that the whole time. Factually innocent. This stuff was fabricated." While in prison, Garcia has studied the case law with his parents acting as law clerks, digging up information and filing it for their son. Garcia has now filed what's called a "Brady-Pitches Motion," trying to gain access to the personnel files of the investigating officers. He claims those officers tampered with evidence and are corrupt, specifically he thinks they tampered with his cell phone to make him look guilty. NBC Bay Area asked legal analyst Steven Clark to read through Garcia's claim. "Mr. Garcia is not a lawyer, but this is well written. He's obviously spent a lot of time researching this case," Clark said. In a statement, the Town of Los Gatos said it does not comment on pending civil or criminal matters, but has filed an opposition to the complaint. The prosecutor at the time was Jeff Rosen, who is now Santa Clara County's District Attorney. Garcia claims Rosen overlooked some of this key information during trial. "Some of the allegations are shocking, salacious, and they're sensational. The question is are there any merits to the allegations?" Rosen said. In a statement, the DA said "If the court orders any response to the filing by Mr. Garcia, a murderer who serving a life sentence and whose conviction was upheld on appeal, then we will respond accordingly in court." The sides will face off in court Friday morning. Garcia has lost several appeals after his conviction. Clark said this might be his last stand in his claim that he had nothing to do with the murder of Achilli.